Atrial Fibrillation vs Ventricular Fibrillation: What's the Difference? What are the main differences between AFib and VFib? What are the main similarities between these two heart conditions? What are AFib and VFib, and how do they affect the heart? Is AFib or VFib more serious and dangerous? What causes these two heart diseases? How do the EKG patterns differ for AFib and VFib? What is the treatment for AFib and VFib? Can these heart conditions be prevented? What’s the life expectancy for someone with AFib or VFib? Atrial fibrillation and ventricular fibrillation are heart conditions that include the term “fibrillation.” When defined as related to the heart, "fibrillation" refers to a very rapid irregular contractions of the heart’s muscle fibers. Atrial fibrillation or AFib, and ventricular fibrillation or VFib, are both a type of abnormal heart rhythm or heartbeat called an arrhythmia. One of the main differences between these two heart conditions is that ventricular fibrillation is life threatening if treatment isn't begun immediately, while atrial fibrillation generally is not immediately life threatening, but can cause problems with the heart function that are very dangerous if not treated effectively. AFib produces irregular electrical signals in the upper chambers of the heart muscle called the atria (and may include the AV node), causing the heart’s atria to beat irregularly and usually faster than normal. AFib usually is not an immediately life-threatening abnormal heartbeat (arrhythmia). VFib produces irregular electrical signals in the lower chamber heart muscles (ventricles) that are so chaotic that the heart muscles can’t pump blood effectively. This type of heart condition is life threatening, and must be treated immediately or the person will likely die. Both types of heart disease are a type of abnormal heartbeat (arrhythmia). AFib and VFib can be detected by ECG’s and CPR defibrillators (machines that can identify arrhythmias and, if needed, can deliver shocks, or electrical impulses, to the heart to treat a life-threatening arrhythmia like VFib). To understand AFib and VFib, you need to know a little about your heart and how it normally works. The heart is composed of four muscular chambers, two upper and two lower. The two upper chambers are called the atria. The two lower chambers are called the ventricles. The impulse is first generated at the sinoatrial node (SA node), which causes the right atrium to contract sending blood to the right ventricle. The right ventricle then sends blood to the lungs to get rid of carbon dioxide (CO2) and to pick up oxygen (02). The lungs then return the fresh oxygenated blood to the left atrium, which contracts to fill the left ventricle. The left ventricle muscle tissue contracts, and generates the pulse and sends fresh oxygenated blood under pressure (blood pressure) to your body’s organs. Each heartbeat repeats the process, and normally produces an electrical signal that is consistent for each heartbeat. When the electrical signal is irregular in any way, the patient has an abnormal heart rhythm. Picture of a Cross Section of the Heart Including the Atria and Ventricles. AFib and VFib are both termed arrhythmias (abnormal heart rhythms). AFib is a type of arrhythmia termed supraventricular tachycardia, meaning that the problem occurs above the ventricles. For AFib, the abnormal heart rhythms are due to irregular electrical activity in the atria, mainly the right atrium. It usually results in a fast and irregular heartbeat. In contrast, VFib occurs when the electrical signal is chaotic within the ventricular muscular tissue and results in no effective heartbeat so there is no effective blood pressure or pulse generated, which results in sudden cardiac death of the individual if the abnormal heartbeat continues and is not treated immediately (immediately). Picture of the Electrical Activity of the Heart during Ventricular Fibrillation. By far, VFib is more serious. If ventricular fibrillation isn't treated immediately, the patient will have a “sudden death” or “cardiac arrest” and die. In contrast, ventricular fibrillation (VFib) has very short-lived signs and symptoms. About an hour so before the person suddenly collapses due to ventricular fibrillation, some people may have these signs and symptoms. The EKG patterns in most cases are diagnostic for AFib and/or VFib because of the characteristic wave forms each produce. 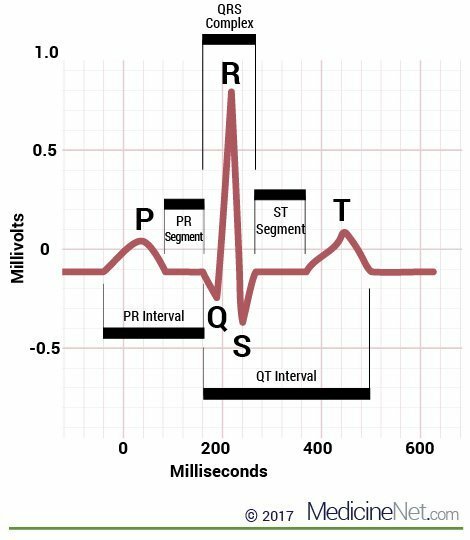 AFib shows irregular P wave patterns (the small “spike” just before the QRS or big spike pattern), which indicates irregular atrial contractions interrupted by QRS patterns (heartbeats or effective ventricular cardiac blood pumping). ECG (electrocardiogram or EKG) of VFib shows only fast irregular electrical tracings with no tracings showing a QRS (the large “spike” pattern on a normal ECG) indicative of a heartbeat (ventricular contraction). Atrial fibrillation may automatically revert to normal sinus rhythm and require no treatment, in a few people. Many people with AFib can be treated with heart rate controlling or rhythm-controlling medications (see prevention). Moreover, some people with AFib may respond well to electrical cardioversion. This is performed by giving the heart an electrical shock that results in resetting the heart’s normal electric pattern. 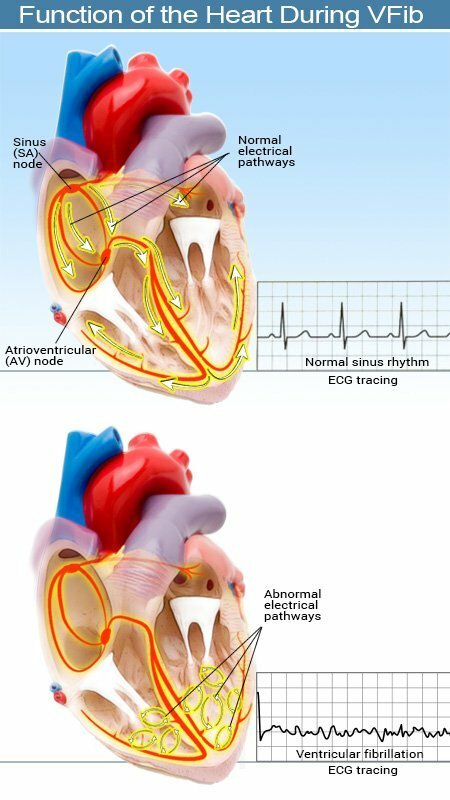 Ablation techniques destroy malfunctioning heart tissue responsible for the abnormal atrial electrical activity. Ventricular fibrillation is an emergency heart condition that requires immediate therapy. VFib can be treated with an electrical shock to the heart with a defibrillator. While a defibrillator is being located, CPR (cardiopulmonary resuscitation) with chest compressions is used to keep the person alive until a defibrillator shock terminates VFib. This allows the heart to produce an effective electrical current that causes the ventricular function to become organized enough to pump blood (for example, return to normal cardiac rhythm). Ventricular fibrillation may be the end signs of a dying heart and may be difficult to treat in some instances. Defibrillation in these cases may not work and the patient may die due to cardiac arrest. Implantable devices (cardioverter – defibrillator or ICD) that detect VFib and automatically shock the heart; and treatment for underlying problems like coronary artery disease (for example, angioplasty, stent placement and/or coronary artery bypass surgery). These treatments may reduce the chance of sudden death from VFib. A surgical technique termed the Maze procedure may be performed in which a surgeon creates small cuts in the heart to form scars that interfere with electrical impulses that can cause AFib. Underlying causes usually determine the life expectancy in people with AFib. People who are treated for the causes or triggers of AFib (for example, alcohol intake, metabolic problems, coronary artery disease, sepsis and many others), usually will have a normal life expectancy. Those who respond poorly to treatments will have a poorer prognosis. VFib needs immediate treatment (CPR and defibrillation) or the person will likely die within a few minutes. However, if it VFib is treated immediately, it may reduce the chances of having another VFib. In people who survive VFib, the survival rate and life expectancy is similar to AFib if the causes and triggers of VFib are treated and managed. Caution should be taken when using the short form “AF.” AF is also a short form term for another similar heart arrhythmia – atrial flutter – that is closely related to AFib. American Heart Association. "What are the symptoms of atrial fibrillation (AFib or AF)?" Updated: Feb 06, 2017. American Heart Association. "Ventricular Fibrillation." Updated: Sep 2016.